The Petřín funicular in Prague is consists of 510 m of track and, at the steepest point, the incline of the hill it climbs is around 28º. Many people walking up a hill of this nature may find it hard work but, by funicular standards, the severity of the angle is quite tame. Some funicular railways, such as the one at the British seaside town of Saltburn-by-the-Sea consists of two tracks running parallel with each other. Others have one main track that briefly splits into two at some point of the journey to allow the cab travelling up the hill to pass the one going down. The Petřín funicular in Prague is the second type. Although many funiculars only have two stops—one at the top of the hill and another at the bottom—the Petřín funicular has three. The third stop is situated just below the one at the top of the hill and there’s a cafeteria near it that offers some stunning views of the city. The presence of the third stop means the ascent and descent of the cabs halts twice. Once so the descending cab and pick up and drop off passengers then, a few seconds later, both cabs have to stop again for the passengers who wish to enter or leave the cab travelling up the hill. If you are not familiar with funicular railways, the important thing to know is both cabs are joined by a long cable. This is so the weight of one can counterbalance the other. The weight of the cab going down the hill helps pull its partner up the hill. The weight of the one making the ascent ensures the cab making its way down makes the journey at a nice steady rate. Both cars move at the same speed, albeit in opposite directions, and neither one can move without the other. Without exception, funicular railways are always located on hills. An incline is necessary to make the system work. The journeys are generally quite short and, in some cases, the incline involved is incredibly steep. A train would be incapable of making the journeys funiculars do because its metal wheels would be unable to grip the track. Normal railways need level ground, funiculars require hills. The wheels on a funicular cab are only needed to support the weight of the cab and help keep it on the straight and narrow. The pulling power normally comes from a motor that controls the cable pulley and, due to the way the two cabs counterbalance each other, the motor only has to provide enough force to compensate for the difference in weight between the two cabs. However, not all funiculars rely on electricity. Some of them use a clever system that involves filling and emptying water tanks under the floors of the cabs to make sure the cab travelling down the hill is always heavier than the one making its way up. There are very few water-powered funiculars left in the world, not even enough to make double figures, but the funicular that makes its way up the cliff at Saltburn is one of the few that are still powered this way. There used to be more but, despite the fact that water-powered funiculars are a greener way to go, a lot of them were converted to run on electricity. The Petřín funicular in Prague is one of them. The Petřín funicular links the Malá Strana district with the top of Petřín hill. It was constructed at the same time as the Petřín Lookout Tower (inspired by the Eiffel Tower) and was first brought into service in 1891. Service ceased at the start of the First World War and, after the war ended, the funicular remained out of function for more than a decade. The current line (510 m) is longer than the original one (383 m). It has a different track and equipment and is powered by electricity instead of water. It was brought into commission in 1932, but service was suspended in 1965 due to damage caused to the track by a landslide. Normal Service resumed 1985 and the Petřín funicular has been running without notable interruption ever since. How Much Does It Cost to Ride the Petřín Funicular in Prague? If you want to buy a ticket to ride the Petřín funicular in Prague you will need to do so via one of the machines located in the funicular terminals. The ticket price corresponds to a time interval rather than the number of trips. A 30-minute ticket is the cheapest to buy. The most expensive ticket allows unlimited use of the funicular for three days. Depending on when you are reading this, the prices may have changed but, at the time of writing, a 30-minute ticket for an adult cost 24 Kč (€0.94), a 90-minute ticket cost 32 Kč (€1.25) and concessions for children and senior citizens reduced the cost of travel by 50%. Children under six-years-old and adults over the age of 70 travel for free. However, the funicular cabs are not accessible to people in a wheelchair. Passengers are supposed to validate their tickets via the machines located near the turnstiles. From what I saw, many people do not do this, but the majority of travellers are probably tourists who have not taken the time to read the information on the ticket machine and do not fully understand how the ticketing system works. The Petřín funicular in Prague operates most of the year, but closes for a few weeks in March and then again in November/December each year. Summer Season (April – October): Travels every 10 minutes between 9.00 to 23.30. Winter Season (November – March): Travels every 15 minutes between 9.00 to 23.20. If I consider a distance is short enough to walk, that’s what I do. I walk a lot and only use public transport for longer distances (10 km+). 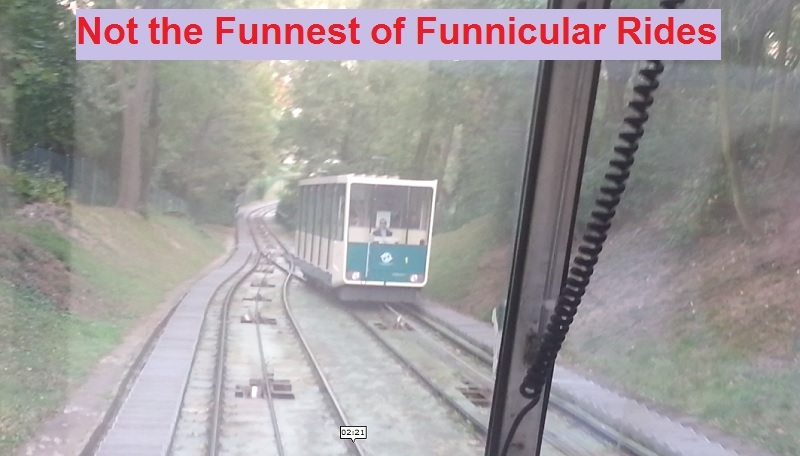 I like funiculars though. Whenever I encounter one I take a ride. I usually just take one trip and always use the cab heading down because the cabs going down tend to offer the most interesting views. So, as is my way, I walked up Petřín hill and, as I passed the lower funicular terminal, I saw lots of people queuing to make the trip up. If you are in good health, the walk is not so bad and, be it via funicular railway or by using their feet, lots of tourists make the journey up the hill to get a closer look at the Hunger Wall or climb to the top of the Petřín Lookout Tower. I wasn’t interested in going up to the top of the tower, so I had a beer (it cost twice what I would normally pay in Prague) and then headed for the funicular terminal. Although I’d seen some spectacular views of the city when I was walking up the hill, the views travelling down in the cab did not impress me so much and I was a little disappointed. I’m glad I made the journey, but it’s far from being one of my most memorable experiences in Prague. The best funicular ride I’ve had so far was in the Portuguese city of Porto, the funicular in Prague is pretty yawn-worthy in comparison, but for those who don’t want to walk or have mobility issues, it provides a quick way to get up and down the hill.